The Audubon Society of Rhode Island (Audubon) has long had a three-part agenda that included Conservation, Education and Advocacy. But why? Why those three strategies? How did they fit together? 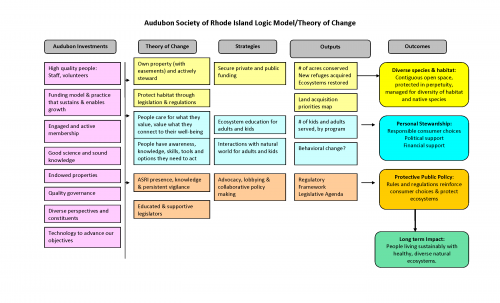 How do they produce the change that Audubon is trying to achieve in Rhode Island? We ask questions like these routinely in our strategy work with our clients. We find that developing a logic model is the perfect way to answer these questions. The logic model is a graphic representation of your core hypothesis: “if we do this, then that will happen.” It’s the path that you have chosen to get from point A to point B. You can develop a logic model for your entire organization, for a department, even for a specific project you are undertaking. Let me change that last sentence. 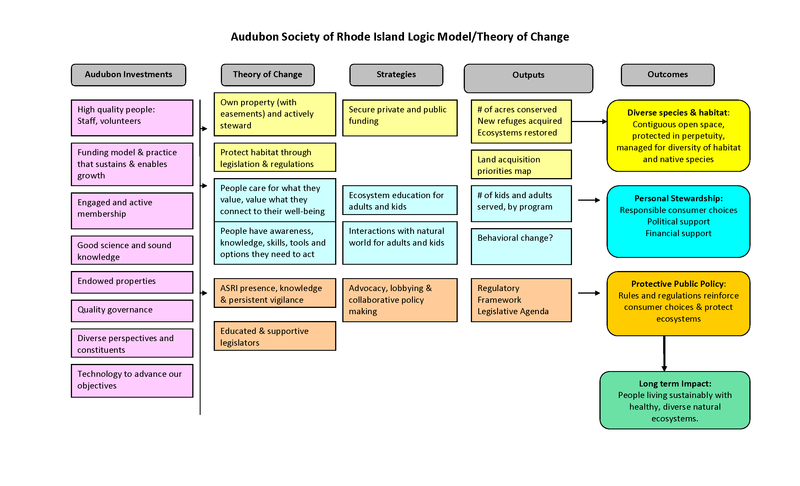 You should develop a logic model …. Why should? Because whether you admit it or not, you are carrying a logic model in your head that guides your action. But if you don’t put it down where everyone can see it, can dissect it, can test it, you could all be working from different change theories or even none at all (as in “we’ve always done it that way”). The framework you are using should have some research-based evidence that it will produce the results you are looking for. But if it doesn’t, if it is experimental based on your local knowledge, or intentionally contradicts the established wisdom, then you owe it to all of us and your clients to let us know the whys of what you are doing and to collect the evidence that what you are doing is working. If you’ve done any government grant seeking, you’ve probably been asked to include the logic model for your program. Before you start complaining how confused you get by the difference between outcomes and outputs, in our strategic planning we use a simplified model that is focused on your theory of change – or why it is that you have any confidence at all that the path you are on is going to get you to the results you are hoping for. Audubon had previously identified its long term vision as a world where people lived sustainably with healthy, diverse, natural ecosystems. 1. Conserve natural habitats, by owning refuges directly or supporting regulations or other actions that would protect them. 2. Enable personal stewardship, by helping people make choices in their lives that support sustainability, including critical political and financial support. 3. Advocate for public policy that protects ecosystems and reinforces personal choices. As a leading environmental organization, Audubon is also frequently asked to take up all kinds of projects. Because they can all see the why behind the work they do – staff, board, members, supporters – choices and priorities are clear. In defense of logic models, by Ian David Moss. One of the best out there.